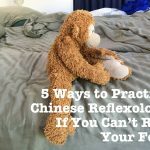 In this amazing event, you’ll discover how to heal hearing and eye problems naturally with Chinese Reflexology. It all begins next week. Eye health and ear-related issues are two of the most popular topics that readers ask me about. 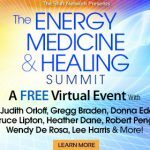 That’s why I’ve been sharing about how to heal and strengthen your vision and hearing in a couple of recent online summits, the Winter of Wellness, and most recently, the Energy Medicine and Healing Summit. Got a headache? Here are six reflexology and acupressure points that you can massage on your hand for quick pain relief. 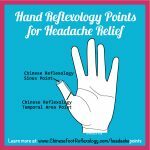 For those times when you can’t massage the reflexology foot points for a headache or migraine, here are six powerful hand reflexology and acupressure points to give you fast relief. There will be times when life is amazing and manifests exactly the way you want. But there will also be times when life throws you curveballs. How do you manage these challenging periods with grace and ease? When things are stressful or the situation is causing you to feel sad, anger, dread, shame—all of those negative emotions—you can ask the Universe for support. Knowing you’re not alone can help you manage these periods with minimal wear and tear to your body. The tricky thing is that when you’re feeling down, your vibration is lower and it’s harder to hear messages from the Universe. It’s like having mismatched frequencies on a radio dial. But you can better hear these messages by adjusting your radio dial. The way to do this is to go neutral as best as you can. And one of the fastest and easiest ways to go neutral is to connect with your Dragon Spirit. In this week’s podcast, you’ll be guided into the Dragon Spirit space to discover how to ask the Universe for help. You’ll also receive a simple technique to feel calmer and more centered right away so that you can hear the Universe’s guidance. P.S. A new episode is released every Monday morning. Find every episode on iTunes or my podcast blog at: www.hollytse.com.